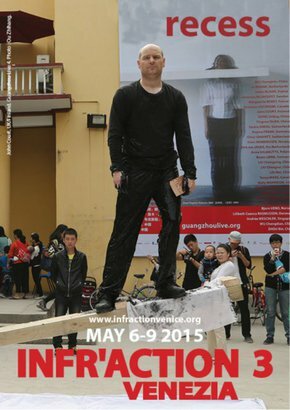 We are very pleased to showcase the 3rd edition of the international encounter of performance art, Infr’Action Venezia with 39 artists from 18 countries. It takes place as an independent event during the professional preview of the 56th Espozione Internazionale d’Arte from May 6-9 2015. You find Infr'Action Venezia around the Giardini Pubblici, viale Garibald and Arsenale. This years theme is recess, about which you can read more about in the curatorial concept page. Infr’Action Venezia is a non-funded, humble and low key event, adressing itself to those appreciating an art that goes beyond the label and the frame. venicelive.org © All rights reserved.